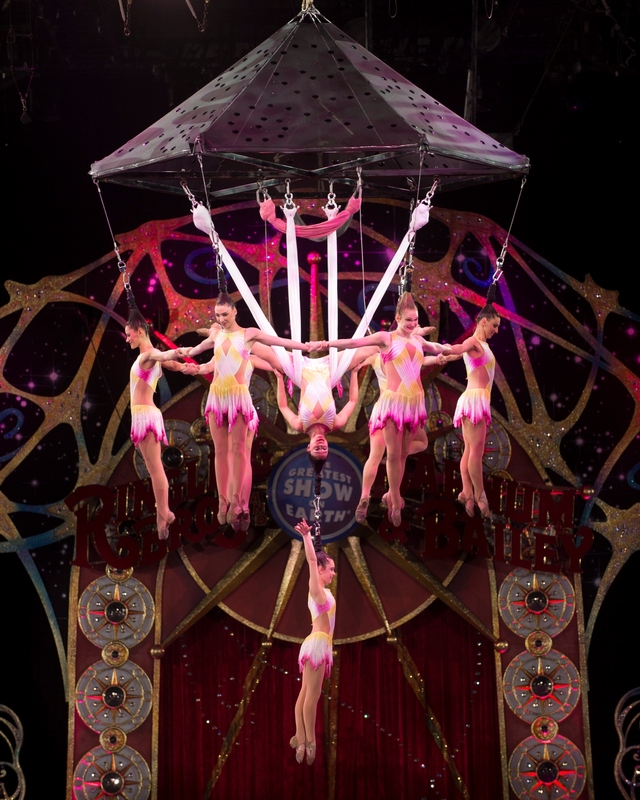 For nearly 145 years you've come to Ringling Bros. and Barnum & Bailey, thousands at a time to see men and women fly, but not merely fly -- soar, glide and dance in mid air. You've come to watch the daring amongst us brazenly defy fear and push it back on its heels. You've come to be enchanted by the world's most talented menagerie. You've come for the laughs, the milieu of aromas, an impossible world adorned by dance, bedazzled attire, music and song, to witness human and animal alike fully alive. This "living dream" as Hemingway deemed it, is the most enduring of its kind, yet as dazzling and as amazing as it's always been, it is never lost on those of us who present this impossible world, that in the blink of an eye the dream can be suddenly interrupted. On Sunday, May 4, 2014 in Providence, Rhode Island at the Dunkin Donuts Center we began the first show of our second three-show day in a row. Bodies warmed and limbered, niceties exchanged, prayers petitioned and on with the show. Let the dream commence. It has been said, at least among its participants that a kind of magic occurs when the curtains part and you set foot onto that arena floor in the glow of those bright lights, in the company of a welcoming and anxious audience. Life as we know it is not welcomed. This is the place where happiness thrives and all things are possible. Yet, even in the midst of the most enchanted place, where nothing is impossible, all that we fear, all that we hope to prevent can break out from the shadows and render a sudden and tragic disruption. And so it was on that unforgettable day, when my heart sank along with their sudden descent, accompanied by that gasp that dreaded audible gasp emitted in unison from the thousands in attendance. I was numb. My mind did all it could not to allow me to absorb what had just occurred, as the man in the top hat and tails hasn't the luxury of reacting on behalf of his friends. But, there they were, our precious ladies, daughters, wives, girlfriends, best friends, mothers all lying upon the ground. Miraculously, every single one of our ladies survived the fall. Incidents such as these are not new to the world of the circus. We've experienced far worse. Yet, in the immediate aftermath of such events many are tempted to accommodate fear, falling into the illusion that we can foresee every conceivable risk. But, that isn't reality. We're not thrill seekers or adrenaline junkies, we're circus. Thus, we don't forgo who we are because of the risks or the what ifs that might be lurking in the shadows, that wouldn't be living and that wouldn't be circus. The show must go on. With our community shaken and hollow in the absence of our beloved girls, we entered our next engagement in Hartford, CT accompanied by a spirit of heaviness, and in many respects fear. The lightness and joy that was common in this place of miracles was gone. We were functioning shells not at all preparing to present The Greatest Show On Earth, but an obligation. This wasn't good. Our hearts and minds just weren't present and in our business that can be very dangerous. But alas, "the circus is better than medicine," I recalled. Timely words from a dear friend and fan of The Greatest Show On Earth, named Paul. Paul's affection for all things circus might very well be without peer and that is saying a lot when you consider his affiliation with the Circus Fans Association of America (http://www.circusfans.org), our most endearing supporters. A gifted photographer, our friend is the quintessential gentle giant, who emits joy to the point of tears. When it comes to circus, Paul is the oldest kid I know. Following one of our shows in Newark, NJ, he sighed, "My friend, I'm going to call my Cardiologist and tell him I don't need any meds, just give me circus." Our dear friend would know. This was the first time I'd seen Paul since his beloved wife passed. She was also a dear friend and fan of circus. One can never really know the true nature of another's marriage, but from what I observed their affection for one another was a true sight to behold. It was beautiful. I've never met a man so genuinely grateful for his wife and he was not bashful at all in expressing those sentiments to anyone within earshot. So when she fell ill, as is common in a community such as ours we rallied, sending our messages of support and well wishes, but to no avail. Yet, there he was still his jovial and sentimental self, despite a tinge of sadness, "circus is better than medicine." As artists and entertainers, particularly live entertainers you can never underestimate the impact of your work. Ours is a service with a reach that exceeds our own limited imaginations, even time. Placido Domingo will never know exactly how many 13-year-olds' lives he changed with the mere sound of his voice, as he did for me as a member of The Boys Choir of Harlem so many years ago. As the legendary Geoffrey Holder was so fond of telling my choir mates and I during those strenuous rehearsals for our Broadway run, "it's for that child in the dark who you'll never meet." My friend Paul reminded me, what we do can also be healing, even life saving, as was the case of a young journalist from West Virginia who wrote to me and praised the show for bringing him back from "the brink of death." We meandered through our opening day rehearsal and a meeting designed to lift us a bit. Cast and crew alike were in desperate need of our own brand of "medicine," indeed. Bodies warmed and limbered, niceties exchanged, prayers petitioned, but how does the show go on? How does the dream commence in the presence of aching reality? Early in my tenure as Ringmaster I learned a remarkable lesson. It was opening night at Madison Square Garden, perhaps the greatest moment of my career when I received the news that my father had passed away suddenly. I was in a daze for most of that engagement until I met a young lady. She said she'd heard about my father's passing and that she also recently lost her mother suddenly as well. It was their tradition to come to The Greatest Show On Earth together, she told me. "I just want you to know, I'm so glad you decided to perform, because now I don't feel so alone." The artist is gifted with the ability to lift others even in the midst of their own pain. The evening's performance before a packed and generous crowd at the XL Center was nothing short of extraordinary. Inspired by our brave ladies, bolstered by a boisterous crowd and encouraged by the outpouring of concern and support from fans, friends, family and strangers from around the globe we were brought back to life. Fear, heaviness and doubt were eviscerated by the onslaught of courage and joy it takes to fly, to dare, to soar, to be circus; and maybe, just maybe that inspired performance reached that someone in the shadows who we'll likely never meet. Hence, the show must go on.